Let's face it, bull markets are boring. At least, I think they are. I miss having a market like we had in 2008 -- but then, I love volatility. I think there's nothing more exciting than running both sides of the trade and picking up 50 ES points on a round-trip in one day. You just can't do that type of thing in a bull market. For the past few weeks, I've been trying to balance how to discuss this market at different time frames, so as not to be too premature in discussing the bearish potential and scare people off from playing the long side. The bottom line is that the bearish potential is something I'm anticipating not too far down the road -- but as I discussed yesterday, I'm still not seeing any real signals in the price action about which to become bearish. Nevertheless, I would be remiss not to highlight the fact that I believe we're in the fifth and final wave of the rally -- so today, we'll look at that in a bit more depth. While I don't see anything to be immediately bearish about, the "good" news is: I think the bears' turn to shine is coming soon. 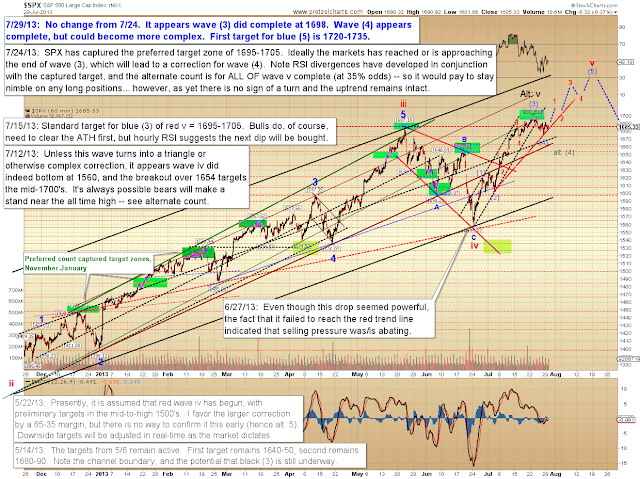 Back in the beginning of February, I published my preferred long-term wave count, with a target of 1750 (+/-) SPX -- and we're finally almost there. I'm still inclined to believe there's another wave up to come here, but I'm also inclined to believe that we're going to see a big correction (or much worse) follow that wave. 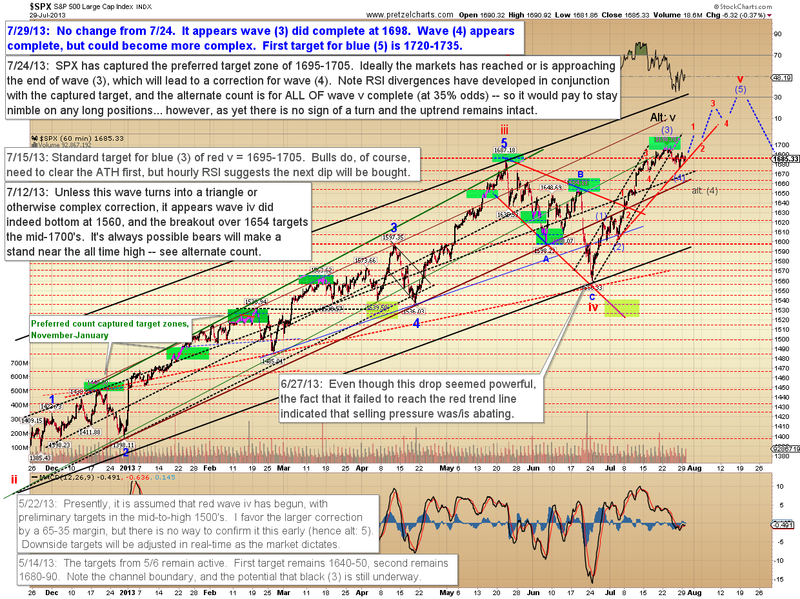 One of the fascinating things about Elliott Wave Theory is the psychological component. Each wave has its own character, and sometimes we can use sentiment to help locate where we are in a wave structure. 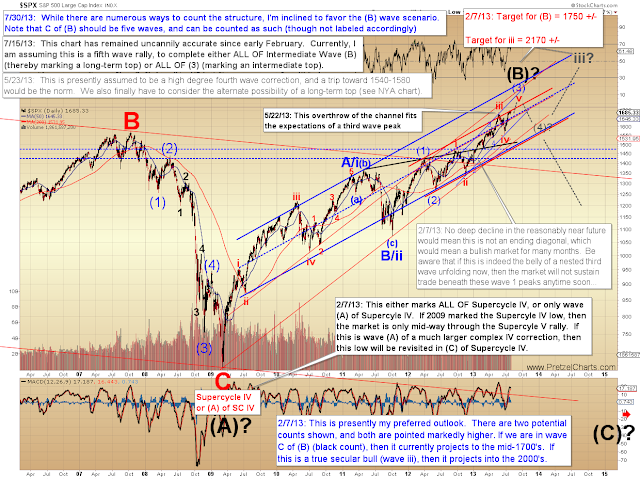 For example, second waves (in bull markets) tend to be the moment at which everyone is most fearful. Third waves are the "point of recognition," where the majority finally get on board with the right side of the trade. Fifth waves tend to be times of either "irrational exuberance" or utter complacency -- or both. I believe we're in a fifth wave now. Accordingly, I believe we should prepare for some sort of major news event approaching on the horizon -- quite possibly as soon as August -- which will start to shift sentiment away from the Invincible Fed Money Machine to "Hmm, maybe things aren't as solid as we think." Ultimately, much further down the road, sentiment will come full circle to "Arrgh, get me out of this market at any price!" I think we're getting close to beginning that bear cycle. The long-term chart shows my preferred wave count, and while I can't rule out the more bullish count, I'm still inclined to favor the black (B) wave rally, which will reverse (ideally sometime in August), and ultimately head back to retest the 2009 lows. Of course, that sounds impossible right now... about as impossible as SPX 1700 did, back in 2009. On the hourly chart, we can see that the structure still appears to need another wave up, to yet another new all-time-high. 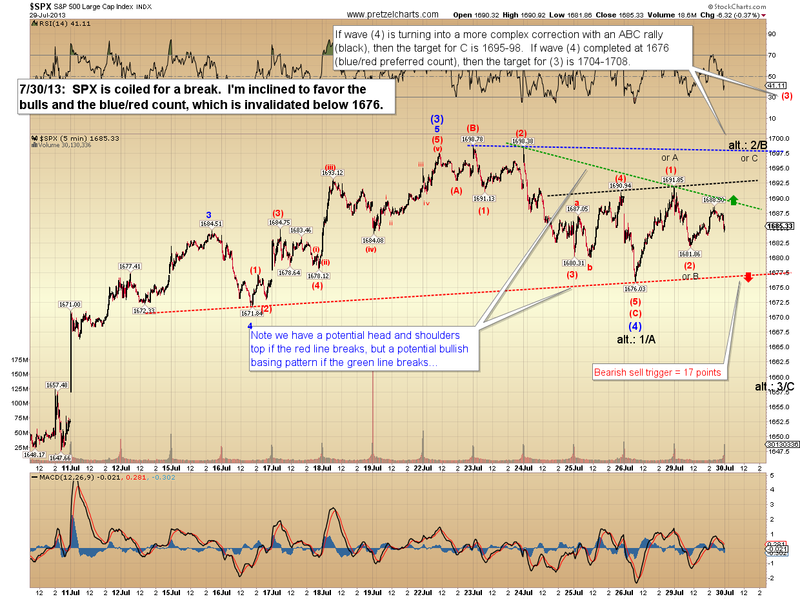 The five-minute chart is my best-guess on the near-term wave structure. 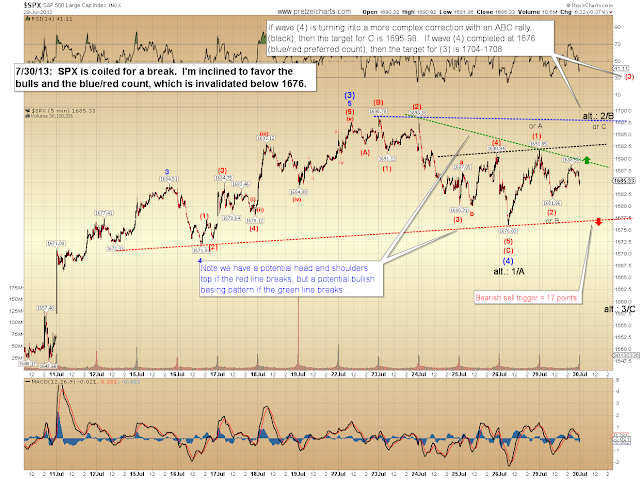 The recent action is a bit messy, which is usually suggestive of a fourth wave correction. In conclusion, I don't think it's time to get uber-bearish just yet, as I believe the structure is still pointing to higher prices. But I think we're getting close, and traders with an eye toward the intermediate and long term may want to consider beginning to position for a fundamental change in the market's character. Trade safe.